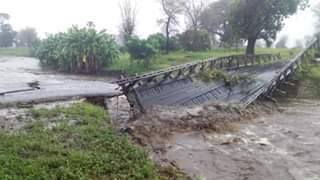 Two people are reported dead in Zomba after their houses collapsed due to persistent heavy rains which have been pouring in many parts of this country. According to the District Commissioner of Zomba, Emmanuel Bambe, the two are from Village Headman Meya in Mayaka Traditional Authority Chikowi in Zomba. Bambe said that he was approached by Senior Chief Chikowi today informing him about the disaster and he sent his officers to verify the matter. And Senior Chief Chikowi has confirmed that apart from the death of the two, 8 people have been injured and 233 houses have collapsed in 6 villages namely Chikumbu -69, Kaselema -78, Henry -37, Kongwe -17, Chimenya -23 and Meya 9. Meanwhile the Zomba District Commissioner has requested all the responsible stakeholders in disaster matters to come in quickly as he has received the rising of water in some TAs like Mwambo, Malemia, Kuntumanji and Nkagula. And he said the matter has already been reported to DODMA as a preliminary report. In a related news, Parts of the country have been affected by floods and damages caused by continuous rains. Raging waters have cut off Makanjira and Namabvi areas in Mangochi after destroying Mukumba Bridge. Meanwhile, Nkando Bridge has submerged in rising water thereby disrupting transportation. Reports also show that hundreds of households are homeless in Neno and they have sought refugee in schools and churches. The Department of Disaster Management Affairs (DODMA) is placing the number of people that have died in light of the incessant rains received in most parts of the country at 23. A statement signed by Homeland Security Minister Nicholas Dausi shows that 29 others have sustained injuries while 11 people have been declared missing.